June 3, 2014 : Interview with Speedsolving.com member Kevin Hays : Currently (at the time of this interview) is the world record holder for 6x6x6 speedsolve average (1 minute, 50.30 seconds) and single (1 minute, 40.86 seconds), and is ranked 2nd in the world for 5x5x5 speedsolve average (59.06 seconds) and single (51.85 seconds). 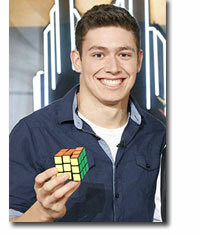 He is the current 5x5x5, 6x6x6, and 7x7x7 world champion (2013). St. Louis, Missouri at Washington University in St. Louis. 6x6. 6x6 has been my best and favorite event since US Nationals 2009 when I surprisingly placed 4th at my first competition ever. Ever since 6x6 has always given me the most success and been my claim to fame. I’ve always had a mind for puzzles and mind games so learning to solve the Rubik’s cube was something that I was just naturally interested in. It wasn’t until my freshman year of high school that another speedcuber I met inspired me to become faster. Definitely my 3 world championship titles from last summer in the 5x5, 6x6, and 7x7. I’m also a varsity swimmer at Washington University in St. Louis. I specialize in the breaststroke events. My biggest pet peeve would have to be people that don’t understand the tremendous amount of work I have put into cubing over the year. I really don’t know what the future of cubing will be like. I would definitely like it to continue and grow as a sport as I think it could be entertaining for the average viewer if it got more publicity. Personally, I’m probably never going to have another performance similar to the 2013 world championships, but I’m definitely going to be involved with going to competitions and hopefully contributing to the community. My most enjoyable cubing experience would probably be the final day of the world championships 2013. I have absolutely 0 complaints about my performance that day (something that rarely ever happens) and that doesn’t even mention how fun it was to hang out with cubing friends from around the world. Either that or being on the Queen Latifa Show; that was pretty cool.